Note: Credits to FrostWraith & others from Smashboards for all the sources & info collected. You can find his thread HERE. --- has more vertical height than Mario in his jump. --- New USmash, which has her using streamers for a wider hitbox. --- He has a new & upright idle stance. --- Running speed & attacks have been adjusted, making him more powerful. --- Uses a dropkick as an attack. --- Up Special has been altered & angled differently with more ground mobility. --- Samus has a new look based on Metroid: Other M.
--- Forward Smash now produces an explosion, having a bigger hitbox as well. --- Thwomp (Down B) has been redesigned with spikes. - Has one of the strongest Side Smash attacks in the game. - Influence to Aura has been increased, making a damaged Lucario a force to be reckoned with. --- Weapons from KI: Uprising added in his moveset. The Upperdash Arm & Guardian Orbitars are new special moves. --- Uses Lumas to her playstyle. --- Luma Shot, which shows different ways to control your Luma. You can switch between controlling the Luma alongside Rosalina or away from her. --- Rosalina & Luma's attacks are very different even when pressing the same buttons. -Beam Sword (Super Smash Bros.
-The game speed is between Melee & Brawl. --- available on the 3DS version and transferable to the Wii U version. These will affect the characters' moves somehow. - Launch Trails with different colors. --- The characters' launch trails when attacked depend on who hit them, being red if hit by player 1 or green if hit by player 4. Sakurai stated this new mechanic makes it easier to know who gets the KO point. --- Character moves have slashing effects that allow players to see the area where the attack hits. --- The outlines can be modified to be thinner, thicker, or completely removed. --- A red-black effect now appears when you're hit by a strong blow. It'll only appear when you have high damage. --- Air time and accumulated damage will determine your period of invincibility while hanging on an edge. Grab controls will no longer be affected by whether you have above or below 100% damage. --- Now consecutive standard attacks will always transition into a finishing move. --- Due to Brawl players recording Subspace Emissary and posting it on Youtube as a "Lets Play", Subspace Emissary is not returning. Sakurai doesn't want to lose future Smash players that will just go to Youtube to watch the Adventure Mode's cutscene rather than playing it first hand. Instead, newcomers will have trailer videos available at the start of the game or after unlocking them. Due to Forumotion's limitations on thread pages, I had to make a new thread for this topic. Also, Palkia confirmed, probably as Pokeball. Thus deconfirming the return of Spear Pillar. Sakurai confirmed that indeed Palkia is a PokéBall. He also says "Palkia appeared in the Spear Pillar stage of the previous game", so I would say this is Spear Pillar deconfirmed. lol yea, at the time i saw the image, it was on the official website cause it didnt upload on miiverse. so i wasnt sure. anyways, is it just me or are we not expected to see returning stages at all? Only one I expect to return is Battlefield. Though I wouldn't be surprised to see a classic stages section in the game that isn't announced until the release. being that sakurai has to focus on two games that have different stage rosters, i have my doubts. if the stages are exclusive based on what platform the games came from, does that mean there will be no pokemon stages on the wii u? There are loads of console Pokémon games, I doubt we'll go without them on Wii U.
I'm assuming that the Pokemon Wii U stages will be either one of the spin-off games or an original stage by Sakurai like he did with Pokemon Stadium and Poke' Floats. a. It was only stated that Wii U will be more console based and 3DS will be more handheld based, not that ONLY console based stages will be in Wii U and ONLY handheld based stages will be in 3DS. b. Palutena's Temple is in Wii U. Perhaps we will see a Pokemon Colosseum based stage, or a Pokemon Rumble themed stage. There are plenty of 3D Pokemon games, perhaps we'll see a PokePark theme'd stage, that's my best bet. Isn't there a Kid Icarus on the NES? I heard somehing about Palutena's Temple being in that game at the end or something. Speculation for Pokemon stage for Wii U: Poketopia from Pokemon Battle Revolution. Am I the only person here disappointed we didn't get conformation of Mewtwo today? After all, it is his birthday. 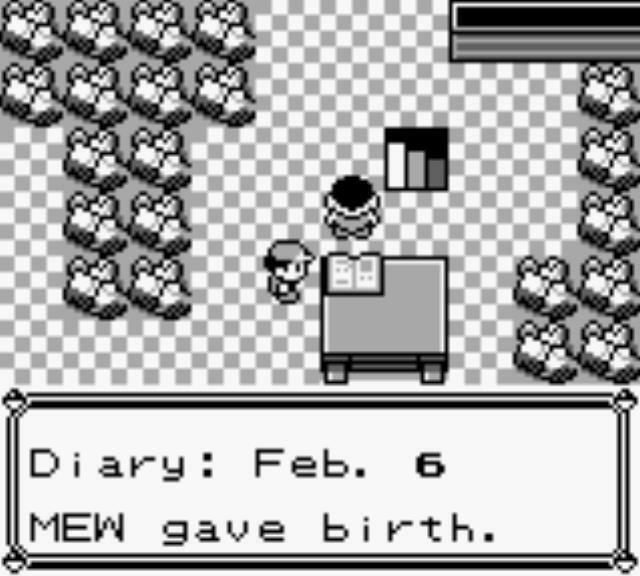 lol I didn't even know Mewtwo had a birthday. I'm not; I wouldn't expect another Pokémon reveal one week from the last one, let alone one that would be treated as a Newcomer in a technical sense. It's apparently also Rick Astley's birthday, so I'm more disappointing that he wasn't announced today. "Pic of the day. Housed within the Control Capsule! Protected by Rinkas! Eyeball armed with a Laser Brain Attack!! The massive Assist Trophy Mother Brain joins the collection!!" Do you think this replaces the Metroid assist trophy? I agree, Metroid deserves much more attention than it gets. I feel that this assist trophy (Mother Brain) gives it more justice. The massive size and it's actions really gives it more of a presence and stands out. While the Metroid (Brawl assist trophy) was a good choice to give fans someone they are familiar with, it just wasn't enough. It really wasn't much of a threat to me since it felt like it just scatters anywhere and escaping the Metroid's attack wasn't that difficult. It didn't have much of a presence either since it was silent, on attacks when making contact, and had the size of a below average fighter. 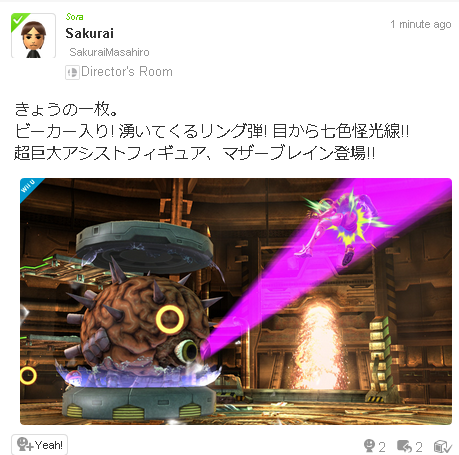 Will Metroid assist be replace for Mother Brain, I wouldn't be surprised. Metroid's task as an assist trophy can be given to a different character that is able to roam around, latch on to a opponent, and attack. It's because Metroid will be playable. Or at least the Super Metroid will. Gives me some great hope for Ridley. After all, if Ridley wasn't playable and they made a new Metroid Assist Trophy, you can be damn sure they'd pick him over Mother Brain. Yeah there's still that. We know given how popular the character is, that Ridley is bound to appear somewhere, and this makes Assist Trophy much less likely.